We did a dash to the library on a recent Saturday evening, arriving just as they were about to close for the night. I made a bee-line for the craft shelves and quickly grabbed a copy of Houses, Cottages and Cabins Patchwork Quilts by Nancy J. Martin, published by Dover Publications Inc in 1984. It’s a book that falls into the ‘worth borrowing, wouldn’t want to own it’ category, which is where libraries are perfect. The book includes finished quilts and household items built around a theme of house blocks. The book has templates for different styles of house and school blocks in a range sizes. I decided to start with a 12 inch house block. I traced the pattern onto sandwich paper and pinned the pattern pieces to my fabric before cutting them out. I must say I enjoyed the contrast of not using the rotary cutter. Sure it was slower, but the work had a relaxing rhythm and a kind of intimacy. This project allowed me to use the Swedish steel scissors that we picked up at a car boot sale on our European trip in 2010. My scissors are stamped with the anchor that indicates they were made by Jernbolaget Eskilstuna, which was established in 1868 and continued for about 100 years after that. However there has been industry in that part of Sweden for a lot longer than that. Eskilstuna has been a base for the steel industry since at least 1654 when the Swedish king Carl X Gustav offered Reinhold Rademacher generous export concessions in exchange for setting up a steelworks there. It’s nice to think that these scissors are a product of that long-standing industrial history, though they are of course of more recent manufacture. This entry was posted in Journal, patchwork, quilt block and tagged patchwork, quilt block, quilting, Scandinavia. Bookmark the permalink. Your block turned out great. 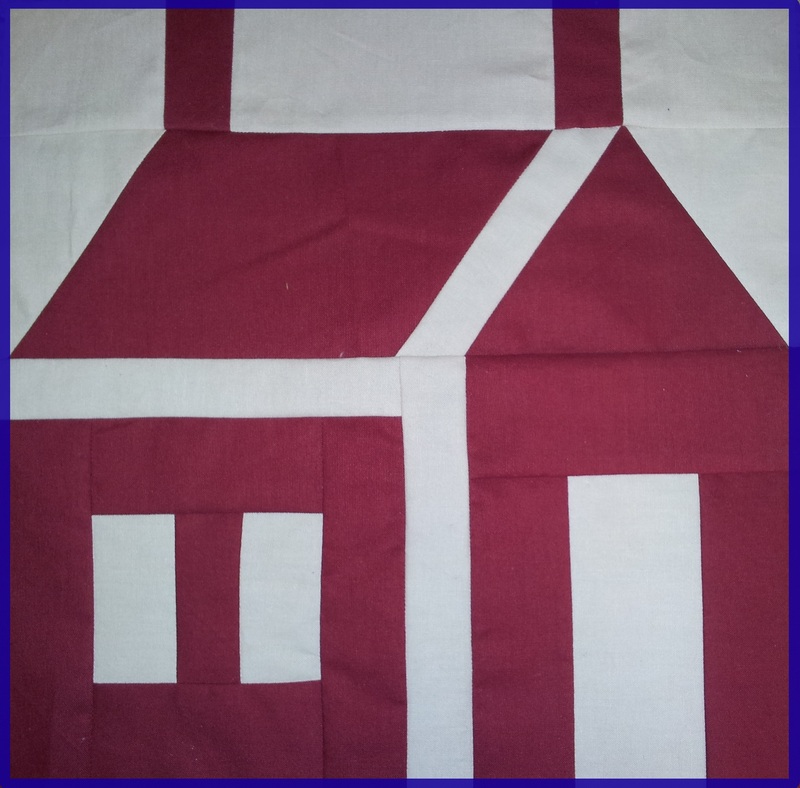 A red and white house block quilt is on my list of quilts to make. Thanks for dropping by my blog and taking the time to comment.